Roast duck breast is one of the things that makes we go weak at the knees – I do still get serious pangs of guilt walking through St Stephen’s Green and seeing the Ducks mucking about in the ponds…..the guilt does go away pretty quickly when the smells from the nearby Asian Market reach me and Daffy starts to look really rather good. Like any produce try and source this locally and from craft butchers, I urge you to steer away from chains supermarkets….if you wan the good stuff stay outta Tesco. 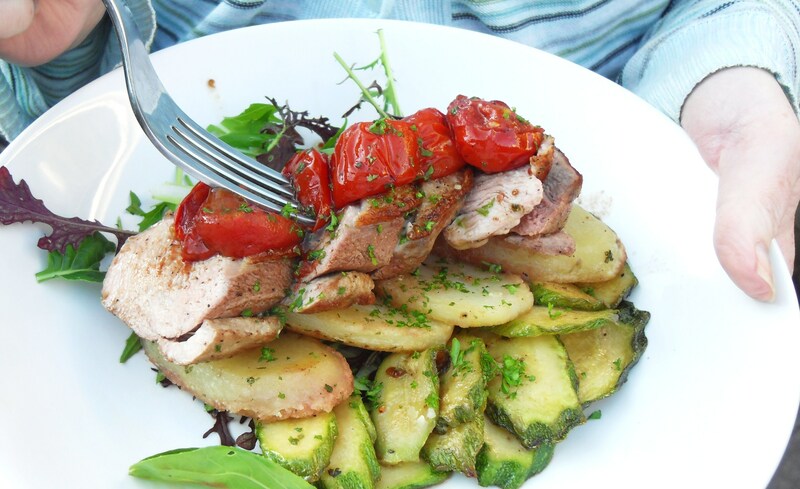 Kick off by searing the duck breast skin side down in a really hot, dry pan – when the duck skin is a deep golden brown flip in over sling in the tomatoes and balsamic, season everything really well and straight into 160c oven. This is going to take about 8-10 minutes depending on how well you want your duck done. As the duck cooks get another large pan on the heat, oil up with a few glugs of extra virgin then in with the courgette, season then saute for around 8 minutes until the courgette is tender but not ‘floppy’!! Next in with the spuds to warm through – at this stage you can take that pan and bounce it into the oven aswell. Next Post The greatest cook book by the greatest chef?